Johann Christoph Pepusch was born in Berlin, but he spent most of his life in London. His best known work is the music for The Beggar’s Opera (1728). In his years in London he wrote a good deal of chamber music, among which we find several works that have obbligato parts for the viola da gamba. 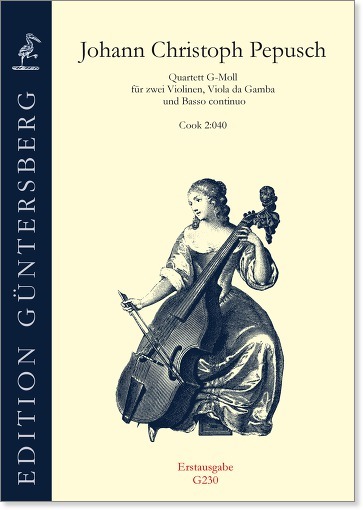 In contrast to many comparable composition of this time the viola da gamba in this quartet in G minor is completely independent from the bass, functioning as a obbligato part in the tenor range. A detailed introduction by Peter Holman puts the work in its historical context.